Version 4.1 allows the user to merge two or more SQL jobs. (Merging of tnj files into an SQL job was already supported in Version 4.0 and is discussed elsewhere. While other areas of the software such as print queues and composite pages may merge successfully, these are not inherently supported and may not merge under some circumstances. Every subject is the Version 4 SQL database is unique and is identified by an 8 character key. A 'subject' can therefore never be in more than one SQL job and have the same key. 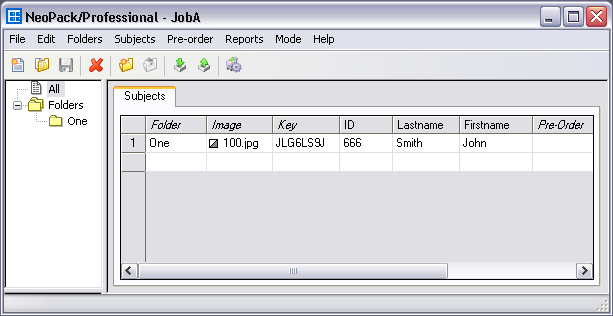 For example 'subject' John Smith with a unique field value (ID) of 666 may be in two or more SQL jobs but he will have a different subject key in each job. Consider two SQL jobs - JobA and JobB. JobA is open and the user wishes to merge Job B into it. The following principles apply. 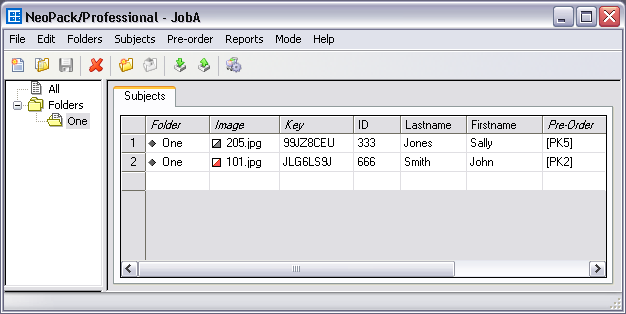 The following screen grabs show JobA and JobB prior to merging followed by the result of merging JobB into JobA. Sally Jones who is Job B but not JobA has been added to JobA with a new Key. When merging, the user has options with respect to the handling of data(details), images and orders. These options are set in the Merge setup window accessible by clicking the Setup button in the Merge window (prior to selecting the job to merge. The merge function can be used to effectively duplicate a job by starting a new job then merging into it the job to be duplicated. This can be considered the equivalent of performing a File>Save as... action with tnj files. It needs to be stressed however that the subjects in the duplicate job will have different keys to those in the original job.